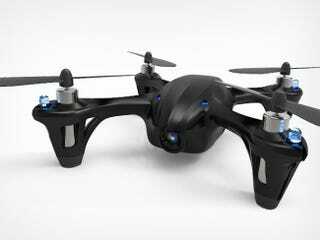 The Code Black Drone is back by popular demand, now at it’s lowest price ever. Right now, you can get one shipped worldwide for just $69 - that’s 65% off MSRP. Don’t miss out - this price won’t last long. Use code CB10 at checkout to apply the full discount. The Code Black Drone features an HD camera and a six-axis control system. There are also four different mid-air flips in the Code Black’s repertoire. It comes with beginner and expert flight modes, so it’s perfect for complete beginners and advanced pilots alike. Plus, with the optional crash pack, you don’t have to worry about the accidental (but inevitable) run ins with walls, trees, etc. Grab yours at the link below. This deal is available worldwide, and will take 2-3 weeks to arrive depending on where you live. This price won’t last long, so don’t miss out! Use code CB10 at checkout to apply the full discount.